You define what's editable and Cushy will take care of the rest. Automagically handling text, html and images. Define editable areas of your pages with a few CSS classes. Provide FTP details and you're done. No programming required and no server requirements. You won't even need to train your clients. CushyCMS is a fast, simple and free content management system that aims to make life easier for web designers by simplifying content management. If you haven’t seen it, Cushy is a completely free and extremely simple to use product that’s come on the market recently. Cushy CMS is a hosted and free content management system that’s lightweight, though powerful enough to jumpstart your site in a jiffy. Cushy CMS is an excellent option. With Cushy CMS you can easily give clients the access and ability to change content of a specific number of pages without everything else that they won’t need. 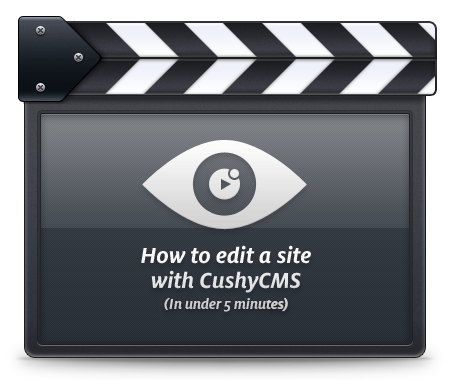 "CushyCMS is a great product. Editing is pitched at the right level for users, configuration is well laid out and simple to use; the support is excellent. Most importantly, it's very robust and provides excellent value for money." "Cushy allows me to offer a bolt-on service for my clients after a site has been completed, and helps to create a monthly revenue." "Cushy has made CMS simple both for the designer and more importantly the client. What's even better is that it doesn't compromise the design." "I have been 'Cushyfying' client websites for about a year now. They love it because it gives them control and flexibility, and I love it because it reduces my workload."